“Check lump”, “New mass”, “Skin Swelling”, Check Growth – Owner thinks it’s bigger”, “Mass bleeding”, “Dog licking growth”, and “Groomer found a lump”. 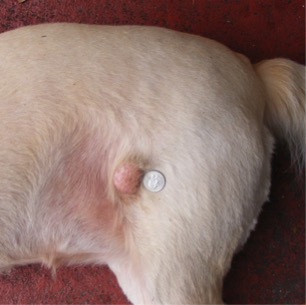 Lumps and bumps are common presenting concerns for pet owners and a frequent physical exam finding for veterinarians. Not every mass that presents needs prompt surgical intervention, but every mass warrants our concern and attention as if it does. What first alerted you to the mass? How has the mass changed since initially noted? Has your pet had other masses in the past? Any changes in appetite, urination, defecation, attitude? Documenting characteristics of masses is crucial. 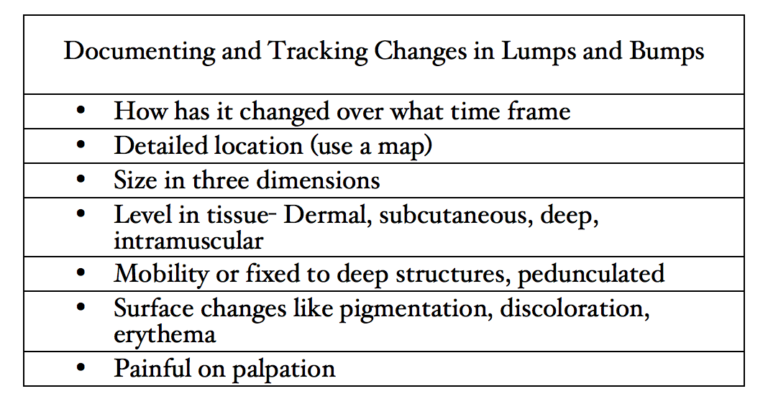 An accurate map of the patient with masses, sizes, cytology results, and when they were aspirated is extremely helpful to track changes, prevent unnecessarily re-aspirating masses, and not miss a new mass. Fine needle aspirate and cytology are an inexpensive, noninvasive diagnostic tool available to everyone. For some tumors that exfoliate well like mast cell, most lymphomas, many carcinomas, a fine needle aspirate (FNA) can be definitively diagnostic (See figure 1). Many tumors do not exfoliate well or have large amounts of inflammation and FNA will not be as helpful. However, even in cases where cytology was not definitive, you have often ruled out several tumor types, which is still of value. Figure 1. Cutaneous lymphoma diagnosed via cytology. Photo courtesy of Emily Fagundo, DVM. False positives and negatives can occur with cytology and the clinician can minimize this risk by giving a good history and description to the pathologist. 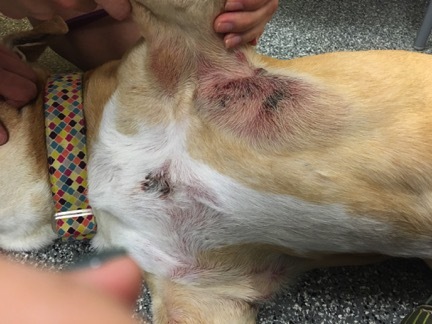 A fast growing dermal tumor with lots of erythema and edema is going to suggest something different than a slow growing, ‘present for years’ subcutaneous mass on the trunk of an older Labrador. Typically, a 22-25 gauge needle is recommended and a single poke through the skin with aspiration and redirection of the needle is recommended to obtain a representative sample. Making multiple slides and checking one to assure a sample was obtained reduces the risk of a dreaded ‘normal RBCs-hemodilution’ result. Soft tissue sarcomas (figure 2) are a common and sometimes confusing tumor to diagnose. They are frequently present for a long time and seem not to change, and so are often mistaken for lipomas. They do not exfoliate well overall. However, cytology matched the histologic diagnosis of soft tissue sarcoma in 63 to 69% of cases in one study, so cytology is worth attempting. We routinely resect soft tissue sarcomas off cytology results. Figure 2. Soft tissue sarcoma diagnosed on cytology, confirmed and graded on excisional biopsy. Photo courtesy of Becky Murray, DVM DACVS. Do you have questions about what to do with a lump or bump? Your MedVet surgeons and medical oncologists are available for consultation with you via phone or email.